Studio580 allows you to paint in the style of a source image that you provide. Before this is possible, however, you need to furnish Studio580 with a source image in a format that it can use. Later, you’ll incorporate this source image into a brush object that is usable within the Studio580 application. The basic steps of preparing a source image for incorporation into a new brush object are illustrated in the figure below and discussed in the paragraphs that follow. Valid Studio580 brush source images are 24-bit true-color images stored in Truevision TARGA (*.tga) format that are either 32 × 32 pixels, 64 × 64 pixels, or 128 × 128 pixels in size. Usually, these source images are extracted from digitized versions of traditional artwork, as illustrated above. Extract—choose a square swatch of image that captures the essence of the artistic style or medium you wish to recreate. At this point, it doesn’t matter exactly what size the swatch is or how it’s rotated. For example, in the figure above, the source swatch (shown stroked in red) is square. However, it is neither exactly 32 × 32 pixels, nor 64 × 64 pixels, nor 128 × 128 pixels in size, nor is it rotated in an axis-aligned way. Indeed, the source patch, while square, is rotated about 38 degrees off-axis, and so appears as a diamond. Align—rotate the image as shown at right in the figure above. If the image contains “strokey” or “sketchy” elements that suggest a direction of travel, rotate the image such that the direction of travel lines up left-to-right. Fit—crop and/or scale the image until it is either 32 × 32 pixels, 64 × 64 pixels, or 128 × 128 pixels in size. When you’ve finished these steps and are satisfied with the result, save the image that you’ve created to a TARGA file. At this point, it doesn’t matter where you save it—you can place it anywhere in your filesystem. You now have a valid brush source image in hand. But one more step is necessary before you can incorporate your image into a brush for use within Studio580. Studio580 brushes require two pieces of data: a source image, as discussed in the previous section, and a similarity map. The similarity map is derived from the source image, and is required by Studio580’s texture synthesis engine. Similarity maps are created via Brush Cartographer, an ancillary application located in the Tools folder (for more information about where things are on disk, see the Quick Tour). Brush Cartographer is straightforward to use. Its user interface is illustrated in the figure below, and discussed in the paragraphs that follow. Brush Source Image—clicking the “Set...” button in this section opens a file chooser, allowing you to select the source image for which you wish to generate a similarity map. Choose the TARGA image file you created in the previous section. Other controls in Brush Cartographer appear grayed-out until you set a source image. 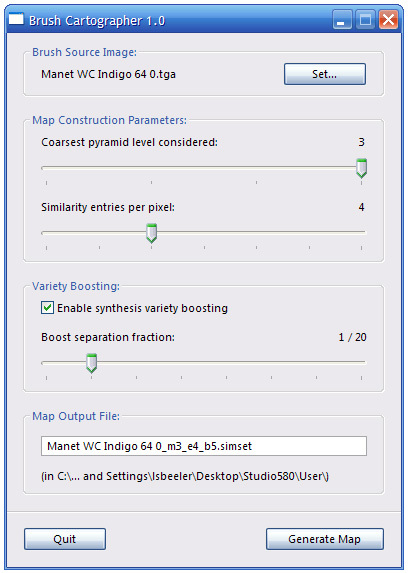 Map Construction Parameters—the key control in this section is the “Similarity entries per pixel” slider. For every pixel in the source image, Brush Cartographer makes a list of other pixels whose neighborhoods are perceptually similar; this slider determines the number of entries in that list. More entries produce smoother, more life-like brush surface textures, but can decrease interactive performance. The default value of 4 often results in a good comprise. Ignore the “Coarsest pyramid level considered” slider in this section. It is used for debugging the synthesis algorithm—remember: Studio580 is a research demo, not production software. Variety Boosting—enabling variety boosting requires similarity entries to be separated by some fraction t of the image dimension. For example, if t = 1/20, and the source image is 128 × 128 pixels in size, then similarity map entries must be separated by at least 6 pixels, since 6 = floor(128t). In general, similarity maps generated with variety boosting produce better synthesis results than maps made without variety boosting. However, control of the separation fraction is important: setting it too high can result in “noisy” synthesis results that lack spatial coherency; setting it too low can mitigate the effects of enabling variety boosting in the first place. The default value of 1/20 often results in a good compromise. Map Output File—allows you to change the name of the similarity map file that Brush Cartographer outputs. Usually, renaming the output file here is unnecessary, because Brush Cartographer generates a descriptive name automatically. Brush Cartographer always writes the output file into the same directory that contains the source image. Generate—once you’ve set your desired options, click the “Generate” button to create the similarity map and write it to disk. During map generation, Brush Cartographer hides most of its user interface and displays only a progress bar indicator. When the progress bar disappears and the usual Brush Cartographer user interface returns, your similarity map file is ready for use. At this point, you should have two files on disk: a TARGA (*.tga) image file encoding the brush source image, and a Brush Cartographer generated map (*.simset) file encoding the similarity map. Follow the instructions in the Readymade Brush Installation Guide to incorporate these files into a brush object that can be used within Studio580.